Size 29.5 inch by 6 inch. Packed in bulk. One of the highest quality products on the market! Easily attaches to any car or truck side window with white plastic molded clip. Great for any vehicle with a retractable antenna. 11 inch tall by 13 inch wide. sold individually. Will not blow off. 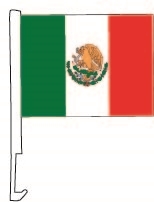 Polyester cloth flag with double sewn hemmed edges. Sturdy 20 inch tall white plastic staff with wide molded clip. Molded clip includes double sided adhesive foam to help the clip stay on when a window is rolled down. Addition of the Boom Pole insures these Clip-On Flags will always "fly", regardless of the wind conditions so your message can always be seen! Premium polyester cloth, double sewn hemmed edges. Durable 24 inch tall plastic pole with wide molded clip that easily attaches to windows. Dimensions: 13 inch tall by 15 inch wide. Double sided flags. Perfect for vehicles with retractable antennas. Sold individually. Custom imprint available. Full color digital print. 2.75 inch by 14.5 inch. Exact color matches; metallic, fluorescent colors not available. Shrink wrapped by the dozen. Minimum order quantity; 10 dozen. Double-sided, Double-Sewn Edges with Blackout Blocker and laser cut technology. Spank your competition! Exclusive patent pending E-Z product. 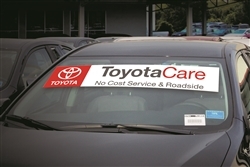 No wind, no worries, your message is always readable. Premium cloth. Durable 2.5 inch tall fiberglass pole with wide molded clip easily attaches window. Double sided printing. Pivoting pole allows the wind to rotate flag, reducing wear & tear. Removes easily without rolling down the window. Sold individually. Change your look by replacing your flags! High quality full color digital printing. Minimum order of only 5. Dimensions: 11 inch tall by 13 inch wide. Premium polyester cloth, double sewn hemmed edges. Spank your competition! Exclusive patent pending E-Z product. No wind, no worries, your message is always readable. Premium cloth. Durable 2.5 inch tall fiberglass pole with wide molded clip easily attaches window. Double sided printing. Pivoting pole allows the wind to rotate flag, reducing wear & tear. Removes easily without rolling down the window. Sold individually. Change your look by replacing your flags! 4 gauge polyethylene plastic. 24- 12 inch by 18 inch per string. 30 flags per 60 foot string. Double sewn on plastic covered rope. 9 inch by 12 inch flags. Addition of the Boom Pole insures these Clip-On Flags will always "fly", regardless of the wind conditions so your message can always be seen! Premium polyester cloth, double sewn hemmed edges. Durable 24 inch tall plastic pole with wide molded clip that easily attaches to windows. Dimensions: 13 inch tall by 15 inch wide. Double sided flags. Perfect for vehicles with retractable antennas. Sold individually. Custom imprint available. 4 gauge polyethylene plastic. 24- 12 inch by 18 inch per string. 30 flags per 60 foot string. Double sewn on plastic covered rope. 9 inch by 12 inch flags. 24 flags per 60 foot string. 12 inch by 18 inch flag pennants. Hi-strength, sag resistant. No local ordinance can restrict the use of American flags. High quality full color digital printing. Minimum order of only 5. Dimensions: 11 inch tall by 13 inch wide. Premium polyester cloth, double sewn hemmed edges. Double thick, 8 MIL, special blended plastic for better color and longevity. Flags are double sewn on 60 foot string with 30 flags per string. Available in four color combinations. Premium cloth. Durable 2.5 inch tall fiberglass pole with wide molded clip easily attaches window. Double sided printing. Pivoting pole allows the wind to rotate flag, reducing wear & tear. Removes easily without rolling down the window. Sold individually. Change your look by replacing your flags! Double-sided, Double-Sewn Edges with Blackout Blocker and laser cut technology. 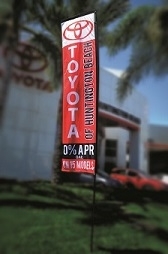 Kit includes: 1 Double-Sided Mini 3D Flag, Fiberglass Poles & Base of choice. 80 pennants per string. 110 foot long string. Red, Yellow, Blue, Green, White, & Orange. 4 gauge virgin polyethylene. Double sewn on plastic covered hi-strength, sag resistant nablon. Double-sided, Double-Sewn Edges with Blackout Blocker and laser cut technology. Choose the message of your liking. 120 foot strings. 60 pennants per string. 4 gauge virgin polyethylene. Red, White, & Blue or Multicolor also available. Custom color combinations.